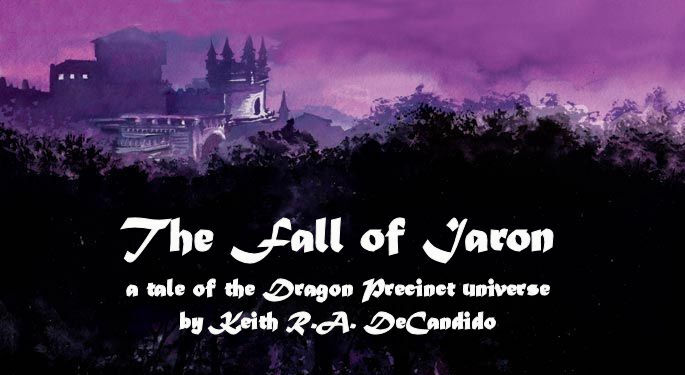 "The Fall of Iaron" is a story I've already written, which takes place in the Dragon Precinct universe, but doesn't involve the Cliff's End Castle Guard. Instead, it's about the wider tapestry of life in Flingaria. It's a story about history being written by the winners, it's about storytelling, it's about what makes a villain, what makes a hero, what makes a tyrant. And it's my latest Kickstarter project! The response to my last story in the universe that didn't involve the detectives of the Castle Guard -- "Gan Brightblade vs. Mitos the Mighty" -- was really good, and people have asked for more stories beyond the scope of Torin and Danthres and the rest of the cops. So here we are. For two bucks, the story can be yours. (For one buck, you get your name in the acknowledgments.) And for more, there are other nifty rewards, including being a character in the story, some "Precinct" swag, an audio of me reading the story, other books of mine, and best of all, my editorial services!